Not that I deserve any treats today since I was out of control most of the day but Mom caved. 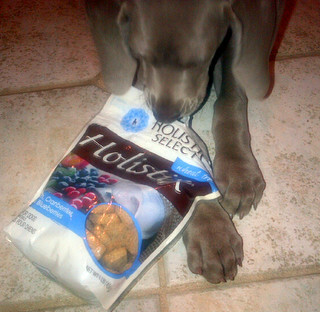 This nice lady named Amy sent me some special treats today called Holistix – healthy dogs treats made with cranberries, apple and blueberries – she tells me I’m getting my antioxidants – anti what? I got to the bag before her and again she snapped a picture of me as I was trying to get one – they sure are yummy. Mom tried to make me behave while she was typing out this blog for me since I have not learned how to type yet. She had hidden one of the biscuits on the desk and before she knew it I jumped up and got it without her knowing – too bad she took it away and I got a time out. Hopefully I can get another one before bed….